The thing with writing a book (as with making a movie) is that a few of your favorite parts will inevitably end up on the cutting room floor so to speak. Since our book baby, Pretty Prudent Home, is now out in the world, we are excited to share all those awesome items for which we didn’t have room in the book. First up is a pair of curtain tiebacks featured in the book, in an image of one of my favorite corners of my house, the reading nook, on page 91. They are a great accent in the space, using the wonderful fabric of one of my favorite designers, Rashida Coleman-Hale, but my favorite thing about them is that Jaime made them for me. When we were down to just a few weeks before the book photoshoot, we divided up the last bits of work and she offered to whip these up. Now whenever I’m wishing I had time to read a book instead of working, I think of Jaime. Thanks a lot Jaime. I kid, I kid, but really aren’t crafty friends the best? Read on for the full project. 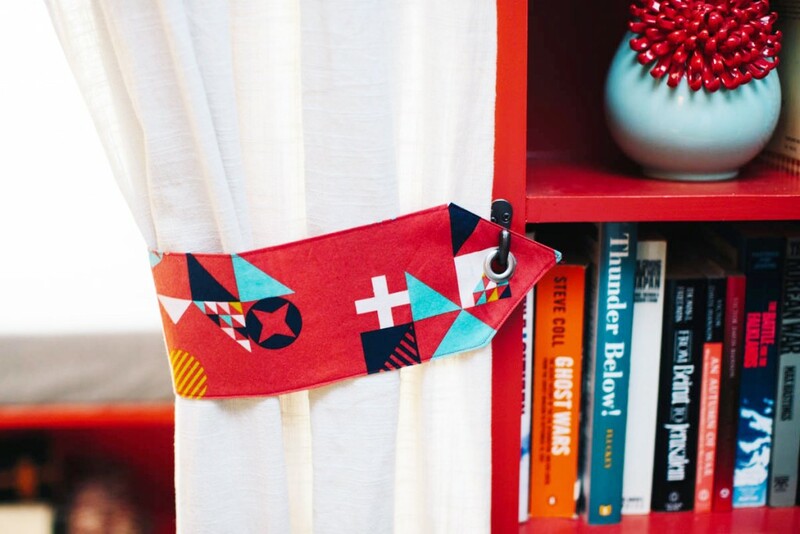 Click here for the PDF instructions for Sew A Pair: Curtain Tiebacks with Grommets, featuring illustrations by Sonya Lee Benham and photography by Annie McElwain and Raya Carlisle. Love the book, and love what yall are foing!! I love the colors of this room. And all your creative touches! Jacinda has such an eye for color combinations, right?? ?